If you are on this site you can not be unaware of the tragic events that unfolded on this football ground on the 11th May 1985 when 56 people lost their lives. We sincerely hope that showing this picture of how the ground looked before this horrendous disaster does not upset anybody or cause offence, if it does we apologise profusely and will of course remove it if requested. The picture was taken from an early 1970's Football Review magazine. 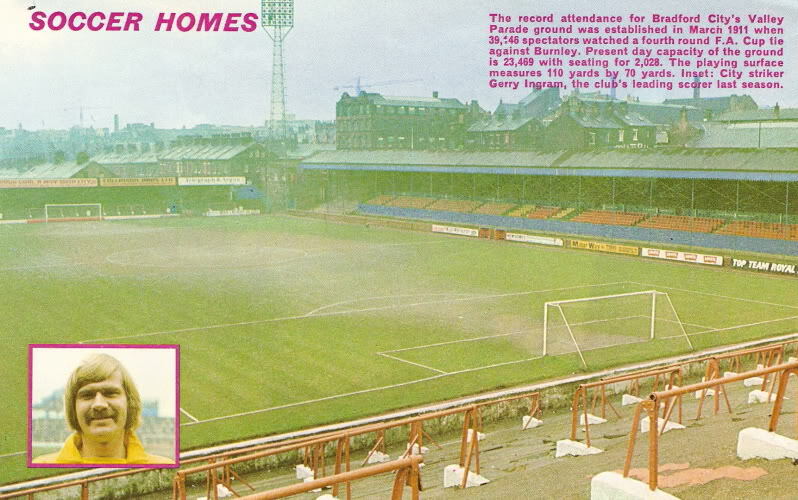 "The record attendance for Bradford Citys Valley Parade ground was established in March 1911 when 39,146 spectators watched a fourth round FA Cup tie against Burnley. Present day capacity of the ground is 23,469 with seating for 2,028. The playing surface measures 110 yards by 70 yards. Inset: City striker Gerry Ingram, the clubs leading scorer last season."